I wasn’t born yet when the brave crew of the Apollo 13 (James Lovell, Jack Swigert and Fred Haise) returned safely to Earth after a major explosion in space had (for all purposes) destroyed their ship’s life support system. However, I will tell you that thanks a lot to directing ability of Ron Howard I was able, over two-decades later, to share a little bit of the exhilaration and triumph that America must have felt on that day back in April of 1970. However, I’ve heard from those who’ve actually lived through it—who remained glued to their television and radio throughout the ordeal—that no mere two hours of film could ever do justice to the actual intensity of the event. They tell me that for five days “everything” hung in the balance. In the eyes of America those three brave astronauts represented the very best and brightest that our nation had to offer. They embodied not only the epitome of our science and technology but they were the ordained representatives of the American spirit of exploration. So yes, I think they were right—everything did hang in the balance. I have been thinking about America’s endeavoring nature a lot in the past couple of days. I owe most of that to a brave 16 year old girl named Abby Sunderland. I’m sure that most Character-Quest readers are familiar with Abby because she’s been in the headlines a lot in recent days. Abby is doing something right now that every individual in America should stand up and take notice of—she is conquering the boundaries of possibility and exploration. Against all odds, under tremendous scrutiny and criticism she is endeavoring to become the youngest person to ever circumnavigate the globe alone. But there IS! I can’t speak for anyone else, but for me personally, watching Abby rise to this challenge is a very testimony to what the Character-Quest is about. It is a testament and fitting tribute to something that has (sadly) all but faded in this age—the American sense of adventure. Abby began training for this trip when she was 13 years old. She’s been taught by seasoned veterans in some of the worst conditions and scenarios imaginable. To quote an Associated Press interview with Abby’s brother Zac “She’s got all the skills she needs to take care of what she has to take care of, she has all the equipment as well,” he said Abby is“prepared and mentally tough”. Zac should know. He currently holds the record for circumnavigating the world solo. He did it at 17. On June 10th, the day before this article was written all of Abby’s training was put to the ultimate test. While crossing the Indian Ocean Abby found herself suddenly faced the very nightmare scenario that many of her critics had warned her about, a dangerous winter storm. Forty hours from anywhere, her small yacht was hammered by towering 30 foot waves. 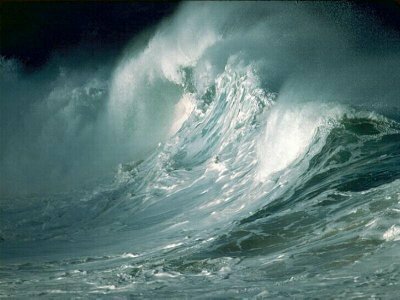 As time passed the raging sea became more and more violent and actually overturned her several times in the inhumanly frigid waters. Then the unthinkable happened. Satellite communication with Abby was lost and her emergency beacons were fired. Abby was down. I don’t know how many people were like me… part of it was the daddy in me…but I’m sure a lot of it was the emotional investment that I had in Abby’s mission which I had followed from afar for so long…but I couldn’t quit looking at headlines watching for news. The articles I read described the state-of-the-art-survival equipment she was carrying including a special floatation suit and some sort of uncapsizable life raft—both of which were armed with radio beacons. This made me feel a little better but personally, I have to admit one of the scariest scenarios that I can dream up is being trapped at night in a stormy ocean full of four-story waves that you can’t even see coming! I could only imagine what this brave young girl (who now to even me looked far too young) was obviously having to endure. It was my worst nightmare realized and I’m sure it was hers too. I went to sleep last night praying for Abby and her family, who despite their hopeful exterior must have been terrified inside. As I write this, I have tears in my eyes. The very first thing I did this morning upon waking was run in here, flip on the computer and check the headlines. I believe that perhaps I felt a little bit like those people who watched and prayed so vehemently for the astronauts aboard Apollo 13. 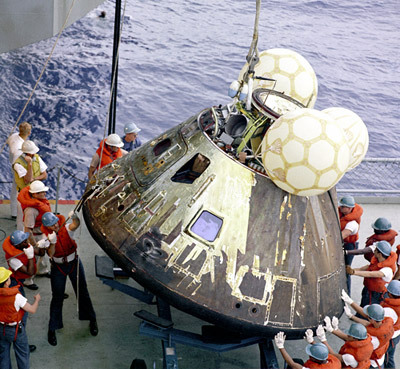 After five long agonizing days the entire country was united in cheer as the capsule safely landed in the pacific with all three astronauts alive and well. By now you all know the same thing that I do and that is that Abby Sunderland was found alive and okay. Her boat has suffered tremendous damage but she is safe. Her quest to be the youngest person to circumnavigate the globe may be in danger but that’s okay. In my mind Abby’s already accomplished a FAR greater feat. You and I live in a country that was BLESSED and ENDOWED with an innate spirit of exploration. Great men and women in our nation’s past have pushed the limits of imagination in every level of human existence. It is precisely this spirit—this God-given attitude that has made America unarguably the greatest nation that has ever existed on the face of the Earth. There was a time when brave young Americans expanded to the West when critics thought that it was nothing more than a foolhardy and profitless endeavor. But these proud individuals not only endured hardship and challenges but forged a new and more complete concept of freedom. They found new resources and natural treasures and extended the idea of America from sea to shining sea. And there was another time in the mid to late part of the 20th century when America again became united in a singular focus…this time to put men on the moon. In that process, which was expensive and was very dangerous we discovered so much of the modern technology and conveniences that you and I enjoy today. America “finds itself” during the process of overcoming challenges…it always has. I salute Abby Sunderland for continuing the American legacy of exploration for the same reason I salute those three brave astronauts of the Apollo 13 mission. They remind me…no, they remind us that collectively we ALL have a stake in the spirit of exploration. They strike a familiar chord in us that says perhaps it’s not wise to back down from dreams like sending men to Mars or even beyond. If anything their example teaches us that we are at our BEST when we are reaching for the horizon rather than sitting around nit-picking at each other. I don’t know what Abby Sunderland will do next. But I bet she won’t lay down after this setback—she won’t give up. If she can’t break this record then she’ll simply find another one and push for it. Why? Because she may be just a little girl in the eyes of some people–but to the rest of us she embodies the very character and values that has made this nation great. With courage and dignity she is bearing the torch of the true American spirit. Frankly, there’s a LOT we can learn from her! I appreciate your article so much. Either you value the courage, hard work, and fortitude it takes to set off on her endeavor or don’t Either you get it or your don’t. I don’t think there is much to dialog between the two camps because the underlying value system is so different. I have tremendous respect for the Sunderland family, their love and vision for their children, and the values such an endeavor requires. It is when these things are attacked that I think at such a personal level, questioning the parents motives, and even suggesting they were guilty of criminal parenting, that it becomes clear the critics come from a different worldview. Those of who share respect and share the values of the Sunderland family though however, must be willing to take a hard look at some of the decisions that were made and determine if they were the best decisions even within these values. To do so does not impugn those values or the character of the Sunderland Family. So enjoyed reading your article on Abby. As you know I feel the same way. Your website is a terrific idea. Hello Michael Bowers, yes, I feel the same as you for Abby with pain in my hart, with anxiety and tears, following her distress, helpless, as if she was in outer space. If she had to abandon ship, she would have an hour or two of life the most, in that cold water, even if she could breed air in tha 50 knots wind and sea spray. This sweet girl was put in life danger. And there is nothing noble nor heroic about sending children to challenge death for sake of media attraction, popularity and busines! Her rescue is closer to that of the Titanic, than the moon crew, and why on Earth do you compare seasoned military weterans of significant age, strength, weathered in army with a child or if you want a very young lady? By sending her arround, for your selfish purposes, and I mean all those who made this voyage possible, Lawmakers, media people, sponsors, father and mother, in a wrong boat, in a wrong time of the year, you showed hunger for shocking stories, your thirstiness for tragedy, and you showed that knighthood and gentlemenship and courtesy are long ago forgotten qualities. Ban those naval laws giving licences for underage people, and ban those races that involve youth in life hazard situations! I certainly respect what you are saying and your point of view. I would like to note however, that Abby has had three intensive years of training under harsh conditions. She also had special gear that was created to help her survive worst-case-scenario conditions. America’s young people have successfully fought for our independence, climbed the world’s most foreboding slopes and have clearly differentiated themselves in times of valor. Though I can definitely appreciate your opinion and argument I would like to reiterate that it is the American Spirit of Adventure…that part of us that is divinely inspired to excel and achieve that has made our nation great. So, I wouldn’t be so quick to sell our young people short. Let’s not give them reasons that they can’t succeed or excel. And let us not discourage them from preparing for and executing dreams. You may wish to portray Abby as another in a line of heroes and pioneers that made america great but she is not, and you are wrong – she was not trying to do anything for america but for her own personal fame and glory – or would you deny that this whole thing was about claiming a record as youngest solo circunavigator, and about reclaiming the record that Zac had for 6 weeks before he was “dethroned” by Mike Perham? Because that is what Abbys own website states was the purpose of the whole endeavour- to claim a record. And actually I dont have a problem with someone wanting to be famous or to set a record – what I have a problem with is the promotion of what she did as some sort of example of how big dreams and ideas should be pursued because her campaign – and I dont blame her for this in any way ,I blame her advisors – yes her parents- her campaign was a desperate careless badly planned last minute rush for fame that seriously endangered her life . It was rushed because of what Jessica Watson was doing and to beat Jessica they had no alternative but to get Abby on a boat as fast as possibleand get her out there no matter what.. Hence they bought that boat at the last possible minute and set Abby on her way after testing it on the water for a single night in almost windless conditions. (This is all on her Blog) And so it was no wonder that within a few days she was pulling in to Mexico – that was not bad luck or just one of those things – it was an absolutely predictable result of the haste, corner cutting and lack of proper testing before departure. As were the three weeks of repairs in Capetwon. As was her eventual dismasting. So to compare that debacle with Apollo 13 and the american pioneers is to do them a huge disservice – certainly the Apollo program took risks and went into the unknown but those astronauts had undergone quite literally years of exhaustive training and study and rehersal and practise to make them as ready as possible for what lay ahead – Abby did almost none of that and thats the fundamental objection to the whole campaign. It is absurd to compare her to well trained and properly prepared pioneers and other sailors who have been dismasted in the Southern Ocean. Her campaign was a failure and a perefct illustration of how no matter how big your dream might be and how brave you might be, or how cute and pretty, if you fail to plan, you are planning to fail. If you want to encourage people to pursue their dreams, especially if they are big and dangerous ones, you should encourage them to prepare and plan and research and check and test and practise and rehearse every bit of it, as far its possible, as thoroughly as possible and for as long as possible so that they wont end up like Abby who did very little of that and so in the end her dream was unfilled. How sad. Paris Hilton wants you all to believe there are shortcuts to fame and to real greatness, but there are none. As far as the logistics and planning go. What similar endeavor ever goes according to plan? Columbus’ or the Pilgram’s trip to the new world certainly didn’t and that was only a half-way around the world trip. What about Magellan? We know things didn’t go as planned for him because he was killed trying to circumnavigate the globe. Respectfully, I think your missing the point. Abby clearly had the training and equipment needed to survive because circumstances tested and prove that hypothesis. You would make a stronger argument by simply saying that she failed to complete her objective of sailing around the world. Then you could validly bring up points about the planning and logistics of her trip. My only argument was her attitude (in my opinion not anyone else’s) exemplified the courage of the American Spirit of Adventure. No Michael I didnt miss the point – I get it about the spirit of adventure and the need to have dreams and to pursue them, and I get your view that in some way Abby embodies that ideal. In essence my point is that realisation of these dreams is vital and hugely important to the individual and to society as a whole – as you say where would America be without its pilgrims and pioneers – and so their pursuit should be undertaken with an intense and singleminded zeal, their fulfillment should be seen almost as a sacred mission. Such big dreams need to be treasured and respected and evrything practical and possible should be done to realise them, and thats exactly the opposite of what was done with Abbys dream.. I think the sunderlands took Abbys dream and turned it into an excuse to make a grab for fame, they trashed the dream and nearly killed Abby. As for your claim that Abby had three years of intensive training before she left, there is not a single shred of evidence anywhere that that is true. 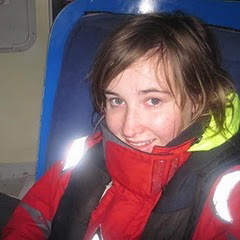 In fact the evidence of her own blog is that she spent almost no time sailing and testing wild eyes before departure in haste to try and grab back the record from Jessica Watson. ANyone who knows anything about sailing found that apalling lack of sailing preparation deplorable and reckless, and was not in the least surprised when she had to stop at Cabo San Lucas such a short time later with problems that would have been ironed out if proper trials had been done beforehand. Failure to succeed in the attempt where all appropriate planning and preparations had been made is something altogether different from failure as a result of setting off on a dangerous quest only half ready. Thats why Abbys venture should not be promoted as an example of how to fulfill your dream. Incidentally when Abby gets back you will surely see her promoters advancing the line that she was totally prepared and sufficiently experienced, and what happened was just unfortunate and nothing to do with her or her boat handling skills or her inexperience. Abby herself on her blog, since the dismasting has claimed she is as good a sailor as anybody, and that the problem was a rogue wave. No, she didnt make a single mistake. Hubris?